In a market bustling with futuristic, almost over-designed products, the MW07 delivers a simple yet focussed approach that ends up being just as usable and ever more practical. Master and Dynamic are a younger audio company that nonetheless carry themselves with experience and expertise. This has been repeatedly demonstrated with their quality headphone offerings and, more recently, in-ears and Bluetooth speakers. They have also demonstrated their adaptability with the launch of some innovative models such as the MW50 that can function as both an on and over-ear headphone. In this vein, the MW07 also represents innovation as one of the first audio-focussed true wireless in-ear earphones on the market. It is priced at $299 placing it alongside other premium offerings from Sennheiser and Bang & Olufsen. M&D’s model offers their signature rock-solid build quality in addition to eye-pleasing design and what I would consider to be one of their best sounds yet. You can read more about the MW07 here. I would like to thank Andrew from Master & Dynamic very much for his quick communication and for providing me with the MW07 for the purpose of review. All words are my own and there is no monetary incentive for a positive review. Despite receiving the earphones free of cost, I will attempt to be as objective as possible in my evaluation. The MW07 has a premium unboxing that reinforces its premium status. Inside a cleanly designed sleeve is a hard box containing the earphones and gorgeous stainless steel charging case. Also included are 3 pairs of silicone ear tips in addition to two sizes of wing fit stabilisers. Master and Dynamic provide a nice fabric sheathed USB-C charging cable in addition to a canvas pouch for the charging case to prevent scratches during transit. The ear tips are quite unique with a funnel bore and thick stem that grant them a rather unique sound as opposed to other silicone tips. As such, I found the stock tips to pair best with the MW07 in terms of sound. The MW07 honours Master & Dynamic’s legacy with the same solid build quality and striking design as their past products. 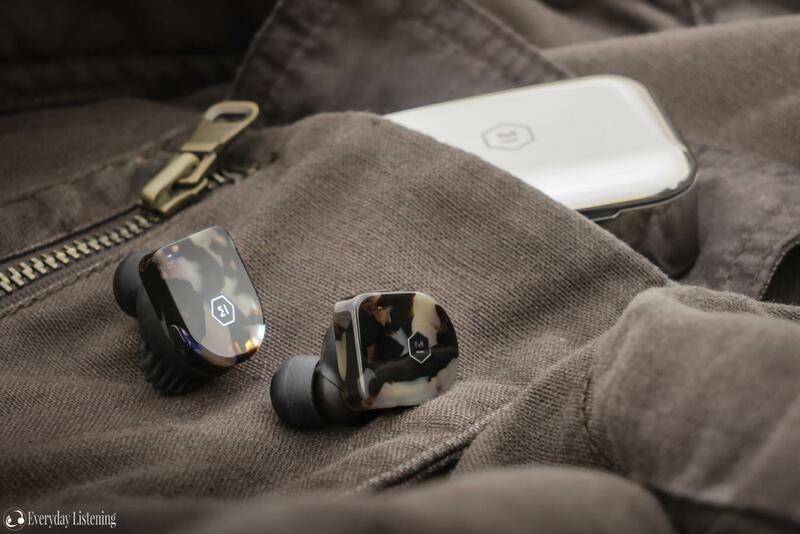 Like other TWS designs, the earpieces are light though M&D’s BOM creates a substantially sturdier feel than competing models, even premium offerings from B&O and Sennheiser. This can be attributed to their hand finished acetate faceplates and use of dense, textured plastics in addition to a high level of finish with smoothly formed edges and clean joins. Another interesting attribute of these earphones is their fit. The entire inner housing is surrounded by a silicone cover with small fins that lock into the anti-helix. This provides additional grip and stability in the ear in addition to enhancing comfort by providing a softer feel in the ear. For my ears, the fins did create a mild hotspot at the back of my ear, however, they were more comfortable to me than the larger Momentum TWS and E8. Also, take into account that they do remain comfortable for the 3.5hrs of battery life that the earpieces offer. It should also be noted that the MW07’s have IPX4 water resistance meaning they are protected from splashing water from any direction. This makes them suitable for gym and commute on hotter days. Unfortunately, the earphones have one issue that compromises their versatility to an extent which is their below average noise isolation. This is somewhat counteracted by their stronger bass that remains punchy even in noisy environments, however, I did find myself listening at higher volumes and missing details that more isolating competitors provided when out and about.